No doubt you’ve heard of Mayor Rob Ford’s criminal lawyer, Dennis Morris. His client’s crack-smoking timeline is in the news again, thanks to the release of another ITO, the document that the police use to get court orders. And Morris is, too. This time, the ITO doesn’t tell us a lot more than we knew already, but a few tidbits will help feed those with a crack-mayor addiction like, well, OK, like pretty much all of us. Foremost among them was the revelation that over a week-long period early last November, the police offered the mayor and his lawyer an opportunity to look at the crack video for themselves. “Baloney,” Morris told CP24. It was a baloney offer. In criminal law circles, this is known as the baloney defence, or as we lawyers sometimes like to call it, using its original, Latin name, “la balogna panino”. The question many have is, why would Morris call this seemingly generous offer baloney? After all, this was and still is a piece of confidential evidence crucial to the future trial of Ford drinking buddy Sandro Lisi. In addition, Morris’s client has not yet been charged with anything. He may be one day, but until he is, he has no right right to view the fruits of a police investigation. Morris says that he declined the offer because it came with too many strings attached; namely, that he and Ford agree not to discuss it with anyone, since it had not yet been presented in open court. To put this demand in context—the crack video is a key piece of evidence in the extortion charge against Sandro Lisi. Without it, the police would have a hard time proving that Lisi threatened somebody over the existence of an object that Ford denied even existed until his hand was forced by Chief Blair. The police and the Crown do not want the pool of potential jurors to be tainted by comments made by people like Ford or Morris as to what it contains—comments that could affect not only how it is perceived by jurors when it’s presented in court, but also what witnesses will ultimately say in a trial. It’s perhaps being overly cautious, but it’s perfectly reasonable: after all, Morris was upset when Chief Blair said that he was even “disappointed” by what he saw. Not only that, but conditions are always attached to viewing police evidence. Lawyers deal with them every day in court when they receive copies of Crown evidence. In a case with major exposure like Rob Ford’s, all the more reason to be careful, since the police do not want to be accused of having been negligent. So why might Dennis Morris advise Rob Ford not to view the tape? First of all, viewing the tape would require the mayor to actually step into a police station, something he has studiously avoided doing since this story broke. And for good reason: if there is one thing that’s tough to control, it’s Rob Ford’s mouth. From shooting it off in the Steak Queen to calling the media maggots for pursuing a true story, this is a guy you might not want to trust in the same room as the police. Better safe than sorry. Secondly, it’s possible that the police wanted to observe the mayor before, perhaps during, and definitely after he saw evidence of himself committing a crime. His conduct, anything he said, and his reaction could all be pieces of evidence that tell a story to a jury if he was charged with an offence. Even silence can speak volumes. We know that the mayor has refused to help the police investigate crimes related to the crack video. Some might think that represents a betrayal of his civic duty as the chief magistrate of this city—that as soon as he was put in a position of having to choose between his own interests and those of the city, he should have resigned. Regardless though, it makes a lot of sense from a legal point of view for Morris to advise the mayor not to cooperate with the police, even by looking at the video. Simply put, the mayor had committed at least one crime, and Morris wouldn’t want to expose him to any further jeopardy. What’s strange about Morris’s role in this situation is that he seems to function as more than Ford’s legal advisor—sometimes appearing to be almost a spokesperson for the mayor’s views. 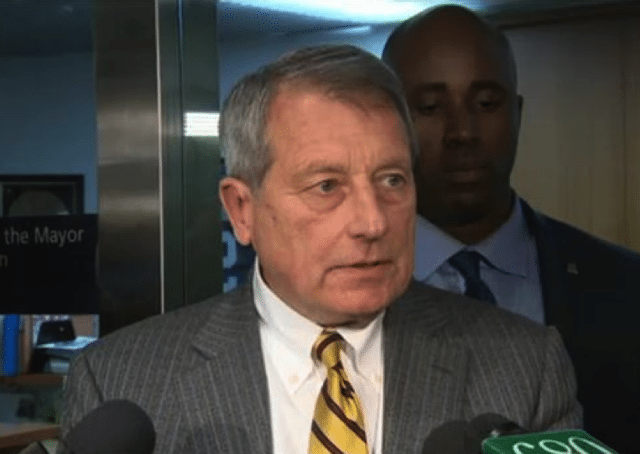 He actually called the mayor the victim in this case during his interview with CP24. It’s possible Morris has adopted the Ford worldview here, which sees the entire police investigation as illegitimate. Through his drug use and association with unsavoury characters, Ford put himself in the situation that led to the crack video’s being put on the media market—which in turn set in motion a series of events that allegedly includes a shooting, a shakedown, and extortion by Ford’s closest associate, Sandro Lisi. Yet to Morris, Ford is the victim. The other disconnect here is that we all know what is on that video. The new ITO describes the mayor talking as he exhales, holding a crack pipe in one hand and a lighter in the other. If Ford saw that video, he’d have to give up one more complaint that he’s been using to smear the police investigation. And so would Morris. So who is Dennis Morris, anyway? The mayor has called him as “the best criminal lawyer in Canada.” The last time Morris had Ford as a criminal client was in 2008, when he had then-councillor Ford’s assault charge against his wife, Renata, dismissed. Over the past ten months, Toronto has become more acquainted with Morris. From suggesting that Ford might have been smoking tobacco or marijuana out of a crack pipe to calling on the chief of police to resign, he has become a regular fixture in crazy town. If he were truly the best, you’d expect him to have a track record that echoes some of the greats. Eddie Greenspan comes to mind, or younger brother Brian. Cross the border, and you have people like F. Lee Bailey, Johnnie Cochran, and Gerry Spence. Spence is a legend—he famously never lost a trial as a defence lawyer or prosecutor. But this “best lawyer in Canada” label comes from Rob Ford and, not surprisingly, Morris’s reputation doesn’t appear to shine quite as bright as those legal stars. One of his most famous cases was one that, for him, didn’t go to court at all. In 2004, he returned a piece of stolen art to the Art Gallery of Ontario on behalf of a client who remained nameless. Apart from that, there’s not much reported about the mayor’s go-to on criminal law. If you search the web, you’ll find almost nothing that doesn’t include the name Rob Ford. And his name pops up only five times on CanLII, an online database that reports most criminal law judgments. But don’t tell that to Rob, for whom bragging is an art. He says he is the best mayor Toronto has ever had, and his brother Doug is going be premier some day. Really, it’s a relief that he didn’t call Morris the best criminal lawyer in the world.